Last night Nintendo held a presentation showcasing Bayonetta and Corrin from Fire Emblem being playable in Smash Bros Wii U and 3DS (Nintendo of Europe shared both videos here and here). 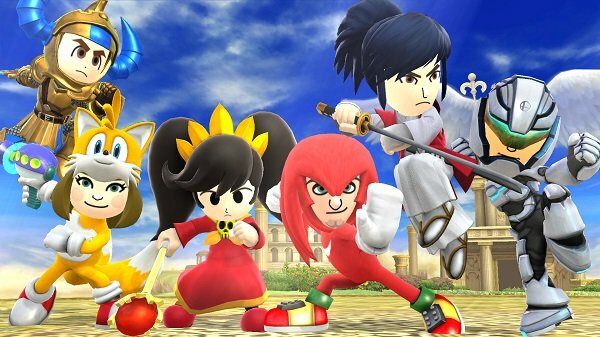 Right after, Nintendo of America and Europe announced that both the characters, and the bonus Mii Fighter costumes featuring (among others) Tails and Knuckles will be released on the afternoon of Feb 3rd in NA and the morning of the 4th in Europe (time-zones and all that). No exact time was given. Via Nintendo of America and Europe‘s twitter accounts. are the costumes part of a patch or do they have to be bought? I think they cost 99 cents a pop. Here I come, rougher than Knuckles. The best of them, tougher than Knuckles. Thanks for the mental images. Time to wait for someone to make the fan fiction based on it. Your welcome Unknownshadow675 I was a first one to say it to anyone on Sonic Stadium first thank you for liking my post on Super Smash Bros For NX rumor spolier really finally your the only one who say it thank you that really means you a lot to me actually Unknownshadow675 for that! The only other article about this has no comments from either of us. Woah Corrin & Bayonetta are both top tear fighters stronger in Super Smash Bros For Wii U & 3DS two gameplays of Corrin & Bayonetta in Super Smash Bros For Wii U & 3DS old Fire Emblem stage from Awakening from last year & Bayonetta stage last new to Super Smash Bros Series! I can’t wait to get my hands on Corrin & Bayonettta of Super Smash Bros For Wii U & 3DS then some Bayonetta stage also in February 3th,2016 this is a miracle in Super Smash Bros For Wii U & 3DS!!! Is like we have top tears fighters from last year two years ago is Mario, Sonic, Luigi, Bowser & Cloud, Mewtwo also Ryu & more to is all thanks to Sakuari of his development team for making us alll hype about it back then in 2013!!!!! So yep I know there’s a new Smash game on Nintendo NX rumor you all know is coming this year spolier get hype anyone for Super Smash Bros For NX only on Nintendo NX only if is true or false we may have to found it this year? Punctuation, do you use it? Aroon has been here for a very long time, and so have you. You should know he has bad english. It’s groundhog day, but SEGA appropriately renames the day Hedgehog day in celebration of their mascot, Sonic the Hedgehog. Actually, Hedgehog Day came first. It was a Roman tradition which stated that if a hedgehog cast a shadow on Candlemas Day, six more weeks of bad weather was coming. The tradition spread across Europe with varying interpretations, was maintained after the fall of Rome, and eventually made its way to America. Hedgehogs are not native to the United States, so people in Pennsylvania decided that a groundhog was a good substitute. And with that brings Sakurai’s Smash 4 to a close, while modders work on Project M U (Wolf and Ice Climbers), and more…. That’s not Bluckles. That’s the ACTUAL Knuckles, trapped in the real world. Then shouldn’t he be named after MY real life OC Rluckles?